The writer, simply named Alfred, relates that travel used to be extremely arduous, even dangerous, and undertaken only in matters of urgent business, like claiming an inheritance or filing a lawsuit. The traveller would be male, well-matured and careful to put his affairs in order before setting out, even if it meant updating his will. His departure was attended with tears and ardent prayers for his safe return. Irishmen come to England and Englishmen go to Ireland. The natives of Somersetshire come to London, and the Londoners flock to Bath. “..whom he had ardently desired to have embraced once more, or to have had the pious gratification of catching their last sigh, and closing those eyes that were shut forever from the light of day! 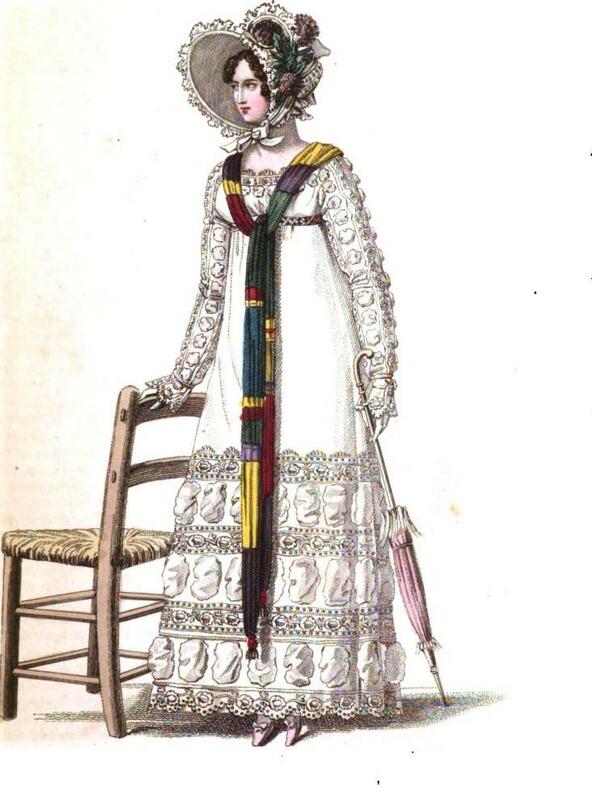 This entry was posted in Regency, Uncategorized and tagged cambric muslin, Regency promenade dress, Regency travelling by Angelyn. Bookmark the permalink. Love your posts, Angelyn! This one was more poignant than the others somehow. The idea of being away for so long and then coming home to find a loved one had passed away. Very sad.